A Tribe Called Quest's influential debut People's Instinctive Travels and the Paths of Rhythm turned 25 this year, and in honor of that anniversary they're reissuing it on November 13. It's fully remastered and also includes remixes by Cee-Lo, Pharrell and J. Cole. Cee-Lo takes on "Footprints" and Pharrell takes on "Bonita Applebum," both of which you can listen to below. The J. Cole remix ("Can I Kick It?") isn't out yet. 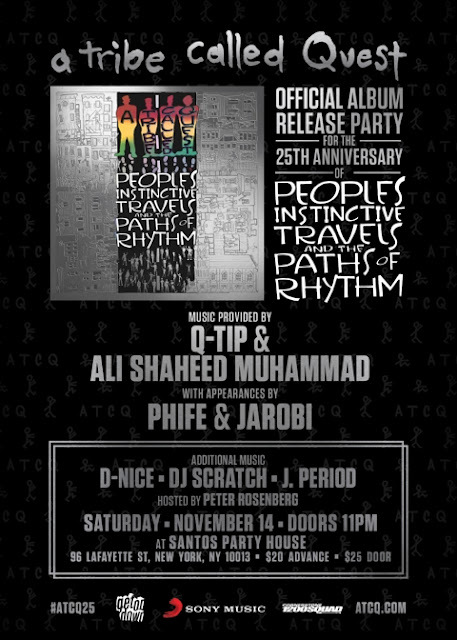 Tribe will celebrate the reissue with a release party in NYC on November 14 at Santos Party House. The party will have DJ sets from Q-Tip and Ali Shaheed Muhammad, and appearances by Phife and Jarobi are promised. That means the whole group (who said they're done playing together) is set to be in the house. Tickets are on sale now.